Alzheimer’s disease has stymied attempts at a cure for generations, but exciting advances in biomedical technologies have yielded new understanding of why the disease occurs and how to eradicate it. By conservative estimates, Alzheimer’s affects 47 million people worldwide, yet its pathology remains largely unknown. Jebelli, who was inspired to become a neuroscientist after his grandfather was afflicted, tells the story of the disease’s devastating impact through the voices of patients and their families. He further unpacks the evolving scientific understanding of the disease by traveling the globe to interview the intrepid researchers who have dedicated their careers to Alzheimer's, attempting to characterize its causes and symptoms in order to devise effective treatment options. While it has long been understood that abnormal “plaques” and “tangles” in the brain erode neuronal function, resulting in progressive dementia, why these abnormalities occur remains mysterious. Also opaque is how to prevent them, even as diagnostic techniques grow more sophisticated, identifying biomarkers and other signs of the disease sometimes years before the onset of symptoms. Yet biomedical innovations such as stem cell engineering and Clustered Regularly Interspaced Short Palindromic Repeats offer real hope that a means to reverse symptoms or eliminate the disease may be within reach. Intriguing, as well, are the clinical trials that suggest certain lifestyle changes—the familiar trio of diet, exercise, and mental engagement—may be our best bet at wholesale prevention. An elegant and precise writer, the author follows every lead for a cure with the panache of a detective novelist, giving readers much to hope for despite the devastation Alzheimer’s has left in its wake. Based on his meticulous and wide-ranging research, he makes a convincing argument that Alzheimer’s will be defeated in the decades to come. 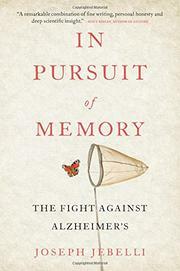 Jebelli analyzes every facet of Alzheimer’s with personal empathy and scientific rigor, a combination that makes for enthralling reading.